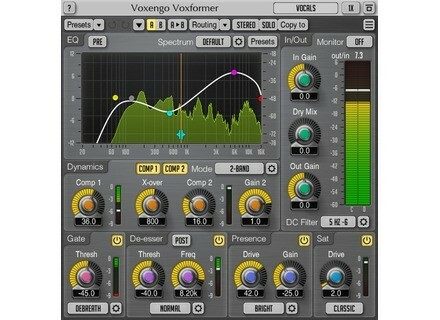 VoxFormer, Software channel strip from Voxengo. 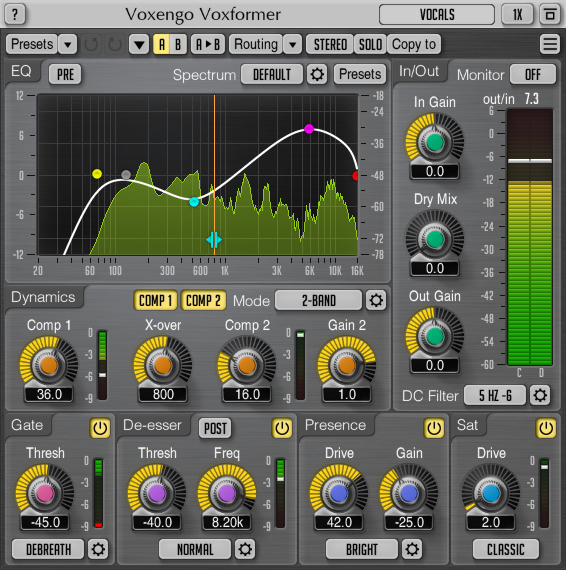 Voxengo has announced the release of version 2.0 of its Voxformer vocal processing plug-in for both Windows and Mac OS X.
Voxformer is a multi-functional vocal channel strip plug-in. Combining several processing modules, Voxformer was designed to be "a comprehensive solution for vocal processing needs" – be it spoken or sung vocals. Voxformer plug-in can be loaded into a audio host application that conforms to the VST or AudioUnit plug-in specification. It is compatible with Windows XP, Windows Vista (32- and 64-bit) and Mac OS X 10.4.11 and above (Intel and PowerPC) computers (2 GHz dual-core or faster processor with at least 1 GB of system RAM recommended). A separate binary distribution file is available for each target computer platform for each plug-in format. A one-month introductory price of $55.95 is now effective, which is 20% off the regular price. Upgrading from the previous version costs $34.95 if the previous version was purchased earlier than 90 days from now, otherwise the upgrade is free during this grace period. Demo versions of Voxformer are available. Audio Damage BigSeq2 Audio Damage has announced the release of BigSeq2, a massive extension to the feature set of Audio Damage's BigSeq gate effect. D16 Group Nithonat D16 Group has unveiled its next classic drum machine emulation - Nithonat, a Roland TR-606 emulation. DiscoDSP HighLife R3 Beta DiscoDSP has announced that R3 beta of the open source version of HighLife is now available.